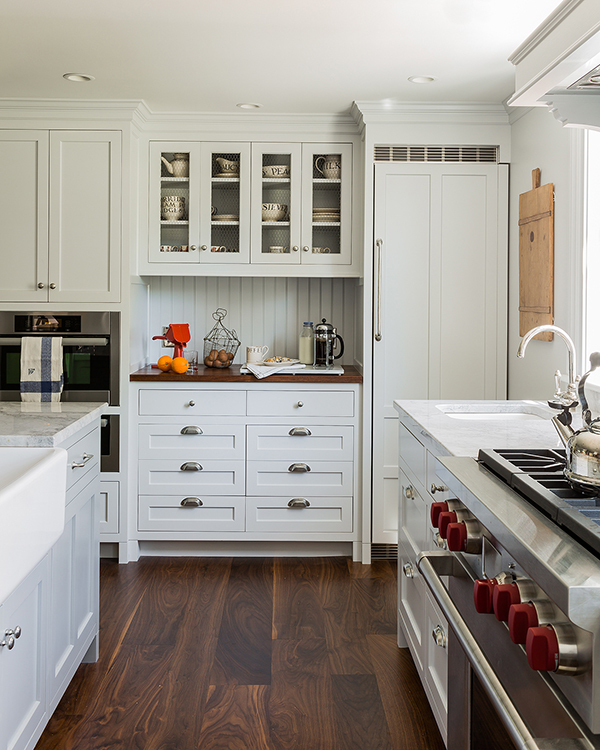 A renovated kitchen in the January/February issue has traditional-style cabinetry with old-fashioned warmth. The January/February issue of Design New England is full of great products and ideas for the kitchen and bath. Here are some others worth considering for your next K+B update. French door-style refrigerators have been around for years and they continue to gain popularity for reasons practical and aesthetic. (The homeowner in our story "Gathering Place," for example, selected one because the half-door configuration means more room to maneuver between the fridge and the center island even when the doors are wide open.) 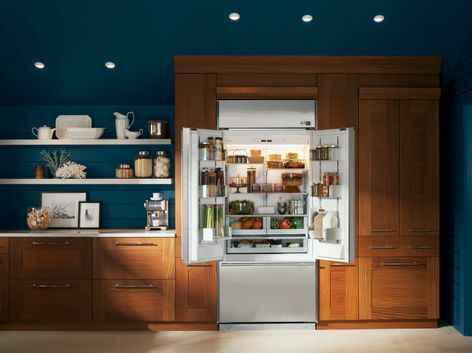 Until now, however, companies such as GE only made freestanding models, but in 2014 the manufacturer's top-of-the-line Monogram brand introduces its built-in French door fridge. Prices start at $7,499 at GE retailers. What's better than stopping in at your favorite tavern for a cold glass of craft beer on tap? How about pulling on the tap in your own home for that icy brew? The True Professional Series 15-inch Beer Dispenser can accommodate a sixth barrel or a slim quarter barrel of your favorite IPA, ale, or lager, and the exclusive airflow technology delivers the brew at a frosty 33 degrees. 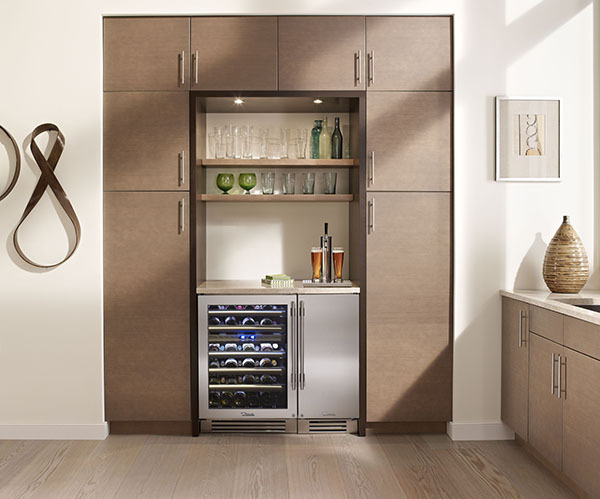 To accommodate the wine-lovers on your Super Bowl guest list, consider the companion 45-bottle Dual Zone Wine Cabinet with two (one for red and one for white, of course) independent refrigeration zones. American-made and UL rated for use indoors or out, True Manufacturing Company has refined its commercial refrigeration know-how for the home. For dealers go to true-residential.com. We're not sure what we find so compelling about this sink. 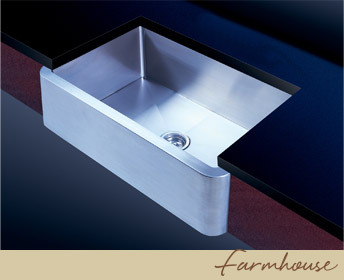 We like the farmhouse style, for sure, but never imagined it in stainless steel. And the squared-up interior challenges our commitment to the curved seamless contours that assure thorough, easy cleaning. Perhaps it is that the spec sheet of this 12-gauge number recommends that "you wait for basin before making your counter top cut-out. All dimensions are approximate." That's because the sinks from Los Angeles based Bates and Bates are hand fabricated and finished. Available through Waterspot, water-spot.com. 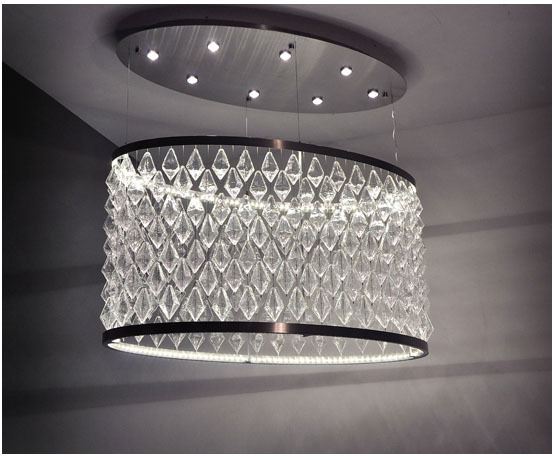 There are so many lighting choices available, we are almost overwhelmed. Almost. We plucked a representation of styles from the luminous plethora starting with our industrial chic selection (above), the Possini Euro Industrial Cage Black 16-Inch-H Pendant Light. For something more uptown, consider the custom work of Lisa Spinella and Paulo DeLima two glass artisans who moved their Studio Bel Vetro from Massachusetts to Healdsburg, California. Their motto is "if you can dream it, we can do it." studiobelvetro.com. And lastly, we move to the bathroom with this Lola Modern Chrome with Frosted Glass LBL Bathroom Light that resembles a row of exotic perfume bottles that glow in the dark. 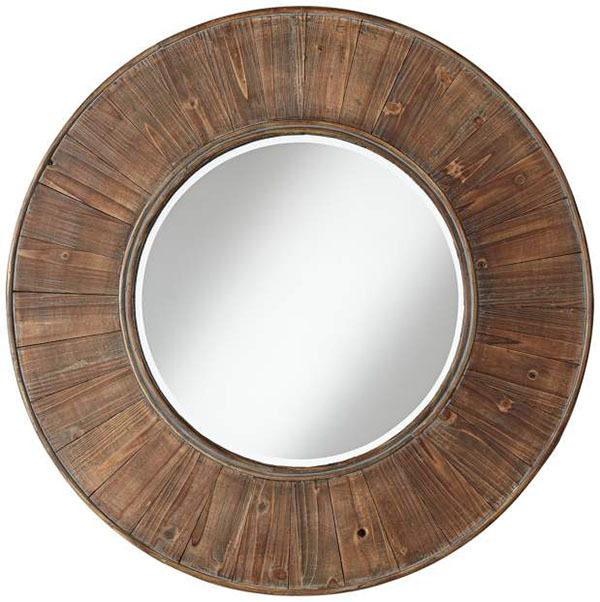 And while we are in the bathroom, how about this for a mirror? A little bit rustic, a little bit modern, a lot bold, it's a future classic. We love it when mundane function meets pretty and the StyleDrain Fleur from California Faucets fills that bill. 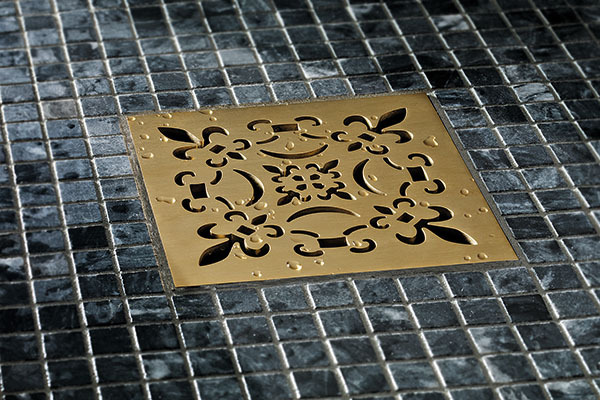 Whether your bathroom is glamorous or plain, this classic fleur-de-lis detail will elevate the design. As with the other six patterns in the StyleDrain series, it comes in more than 30 decorative finishes including polished chrome, English brass, and black nickel, but it is more than ornament as it promises enough high-capacity drainage to handle run-off from body sprays, rain bars, and multiple showerheads simultaneously. The decorative grid retails for $175 to $280; the drain body is priced separately. See californiafaucets.com for local dealers. 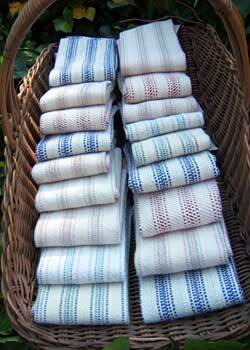 We confess to grabbing kitchen towels from the mark-down bin at the mark-down store, but on occasion we have found handsome, well-made, durable towels such as those offered by Island Weaves irresistible. As hard-working cooks, we find catharsis in the kitchen and a stack of beautiful towels adds to the visual and tactile experience that sooths our soul. If you made a New Year's resolution to eat healthier, consider Slim & Sage. A variation on the classic Willow-pattern diner plate, this dinnerware is designed to guide portion control. Where the vintage blue plate had ridges to separate the protein (think meatloaf with gravy), from the starch (mashed potatoes), from the vegetables (peas? ), this version uses only geometry to designate how much of what goes where. And, unlike the old days when the protein took up half the plate, S&S's plan has the vegetables at 50 percent of the 9-inch dish with the protein and the starch or grain at 25 percent each. We are not convinced that mere design will keep the dieter in line, but no matter, the bold pattern is a handsome addition to the table. 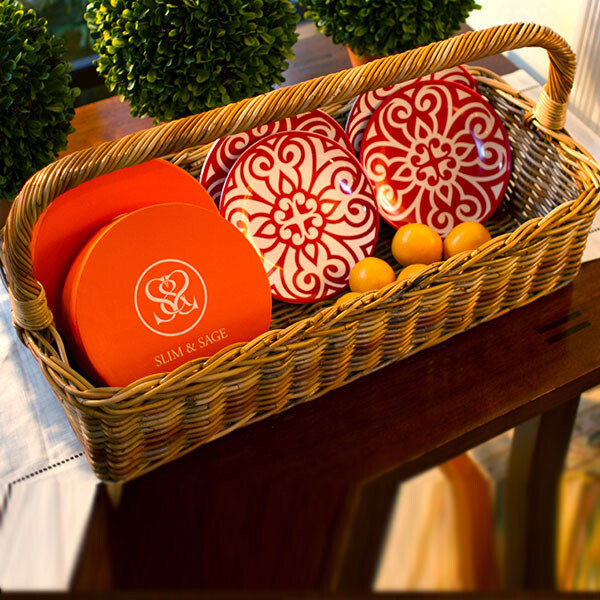 Plates, in red or blue, come four for $99 in a handsome orange box. slimandsage.com. Great design is always at your fingertips! Read the January/February 2014 issue online!